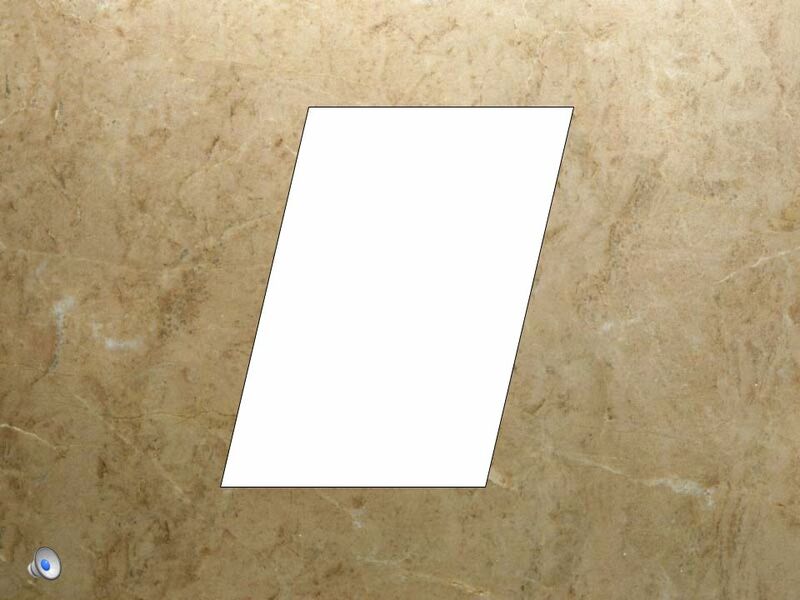 10 pt 15 pt 20 pt 25 pt 5 pt 10 pt 15 pt 20 pt 25 pt 5 pt 10 pt 15 pt 20 pt 25 pt 5 pt 10 pt 15 pt 20 pt 25 pt 5 pt 10 pt 15 pt 20 pt 25 pt 5 pt VocabularyShapes. 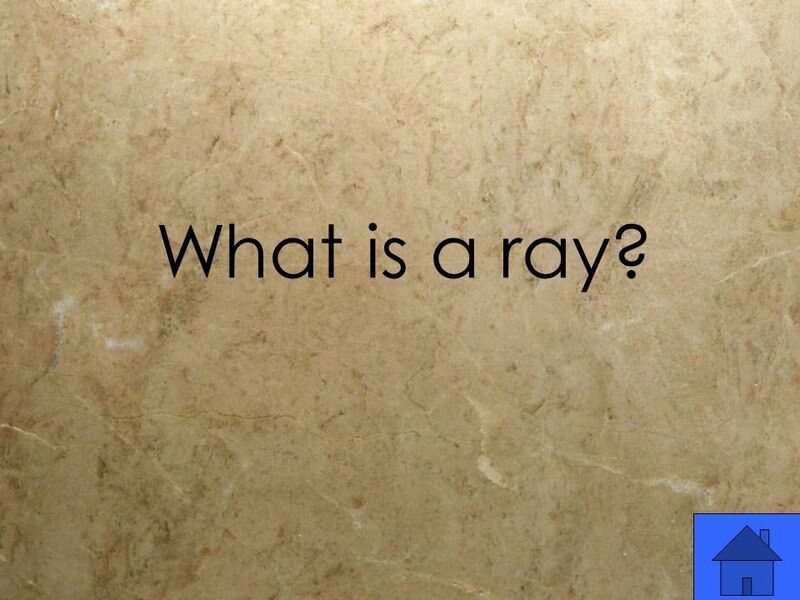 4 What is a ray? 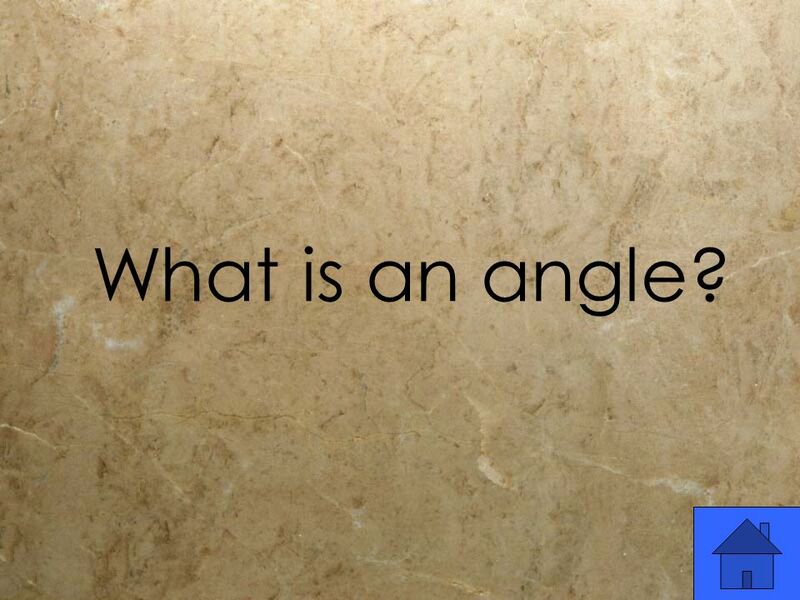 6 What is an angle? 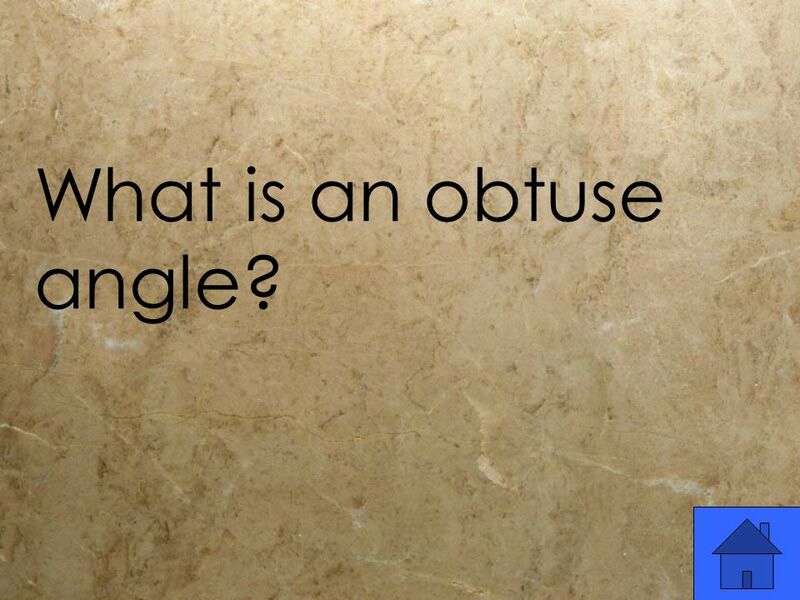 8 What is an obtuse angle? 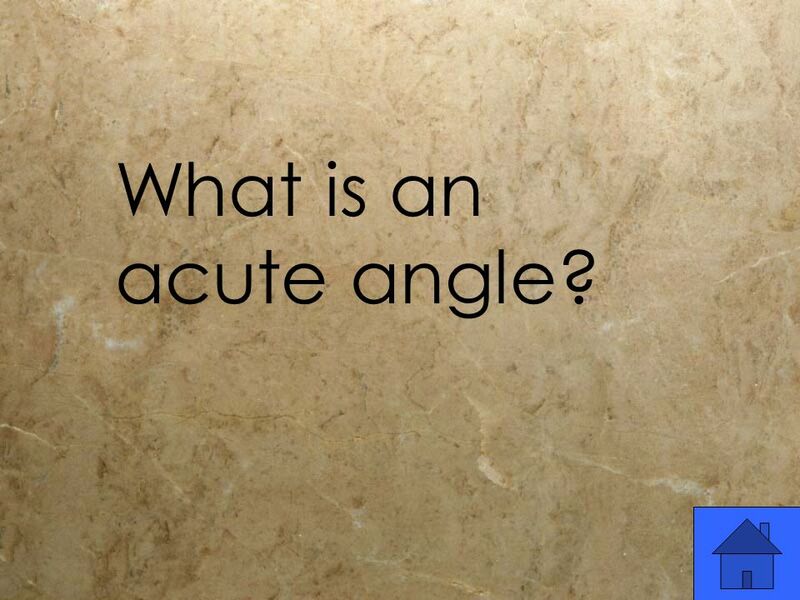 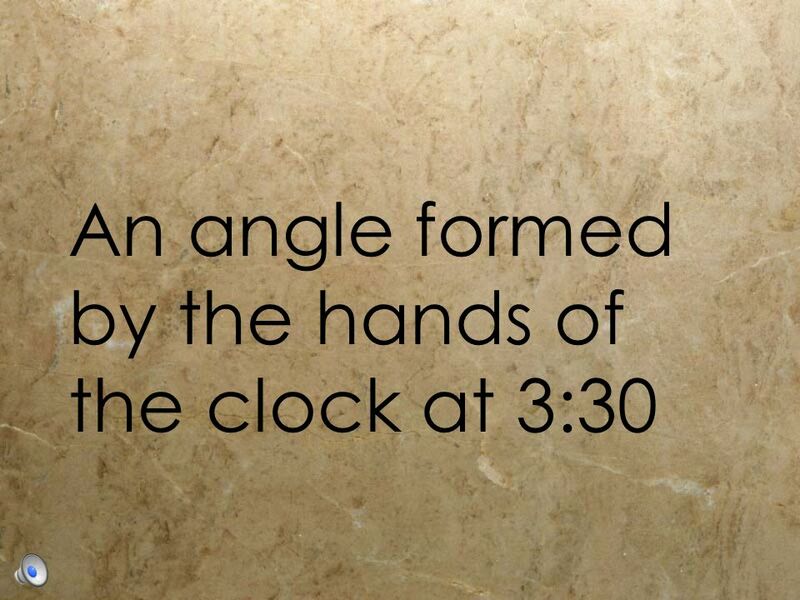 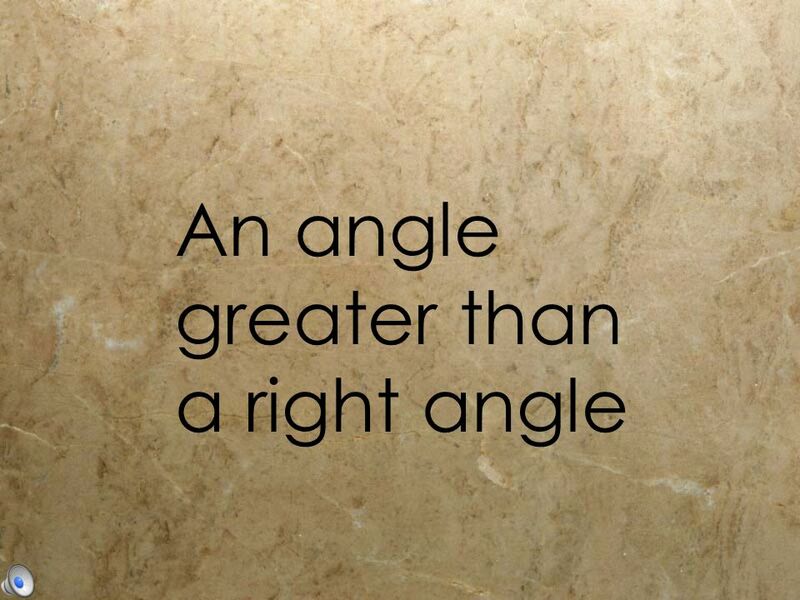 10 What is an acute angle? 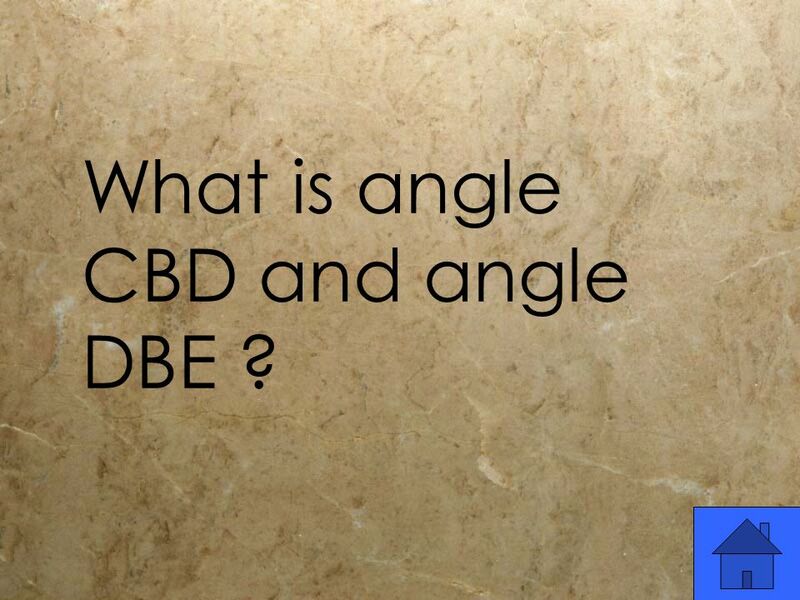 12 What is angle CBD and angle DBE ? 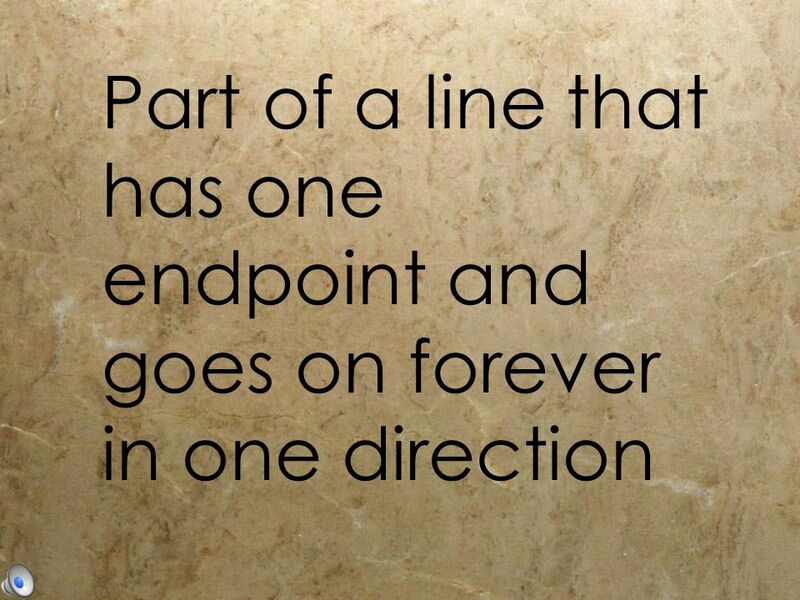 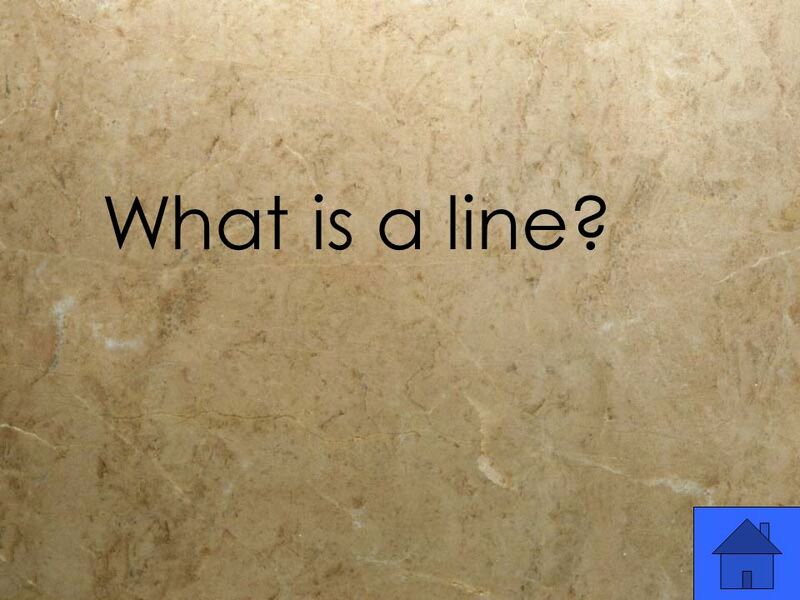 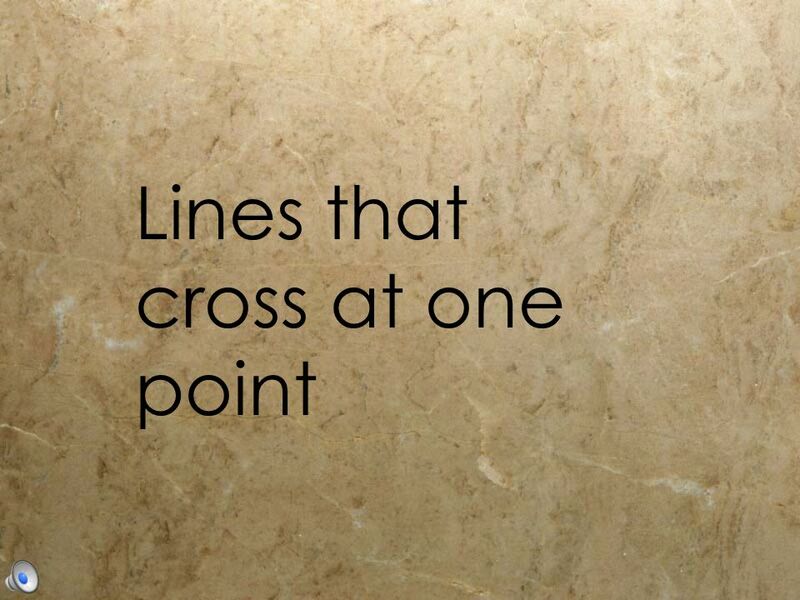 14 What is a line? 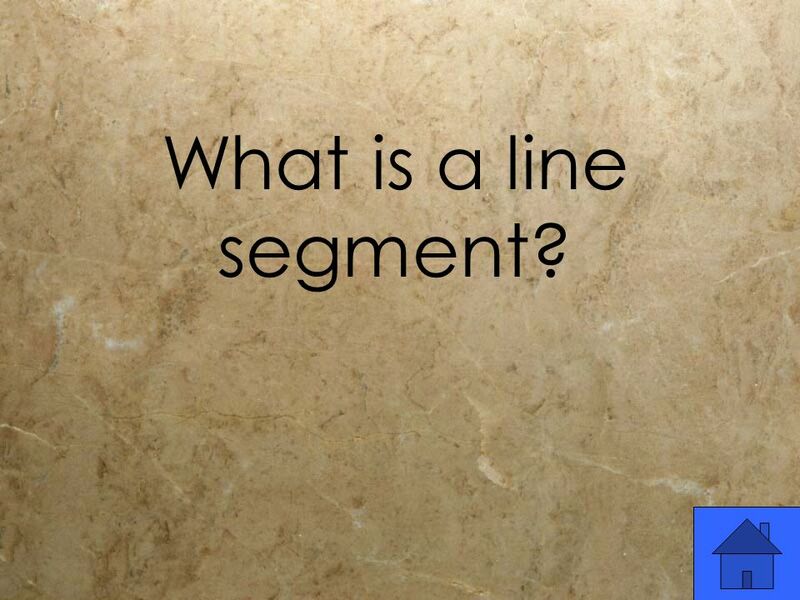 16 What is a line segment? 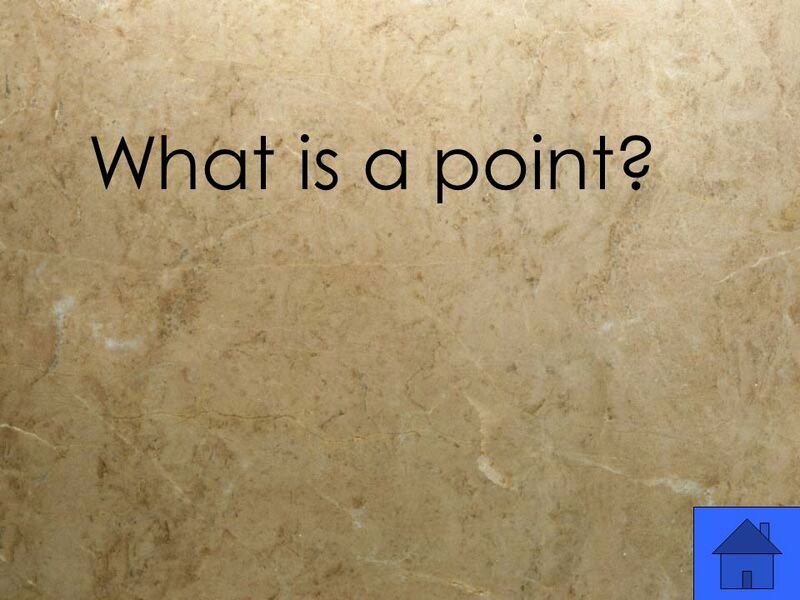 18 What is a point? 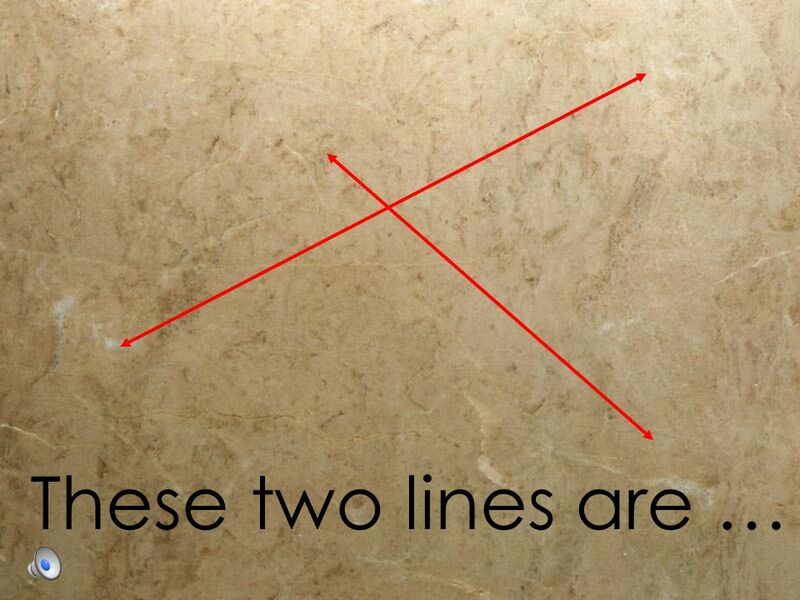 20 What are intersecting lines? 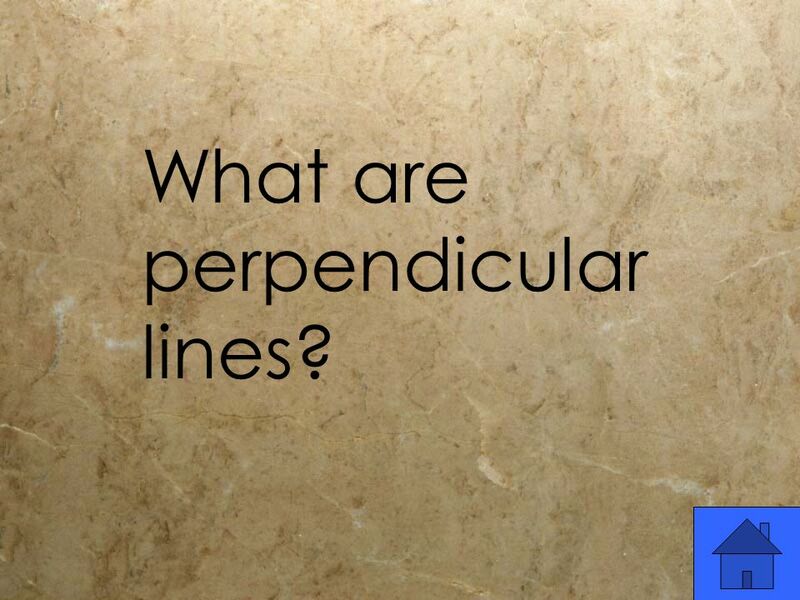 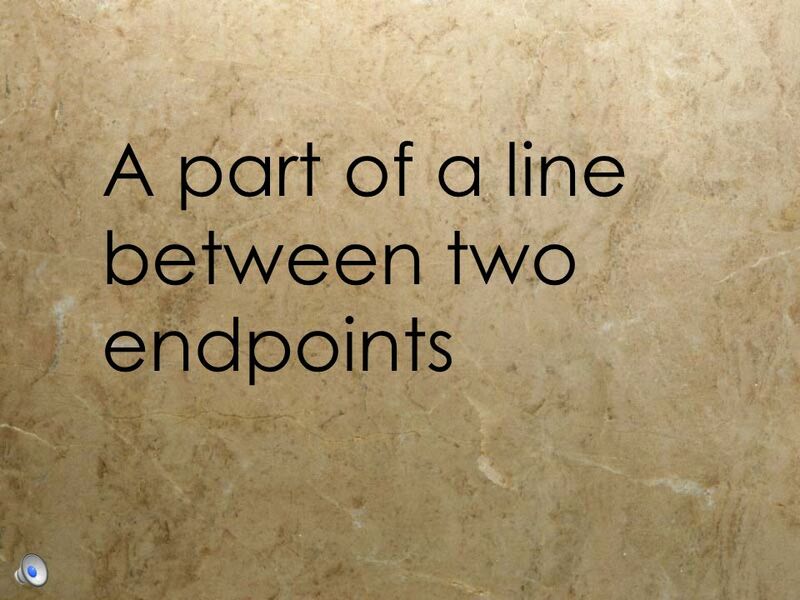 22 What are perpendicular lines? 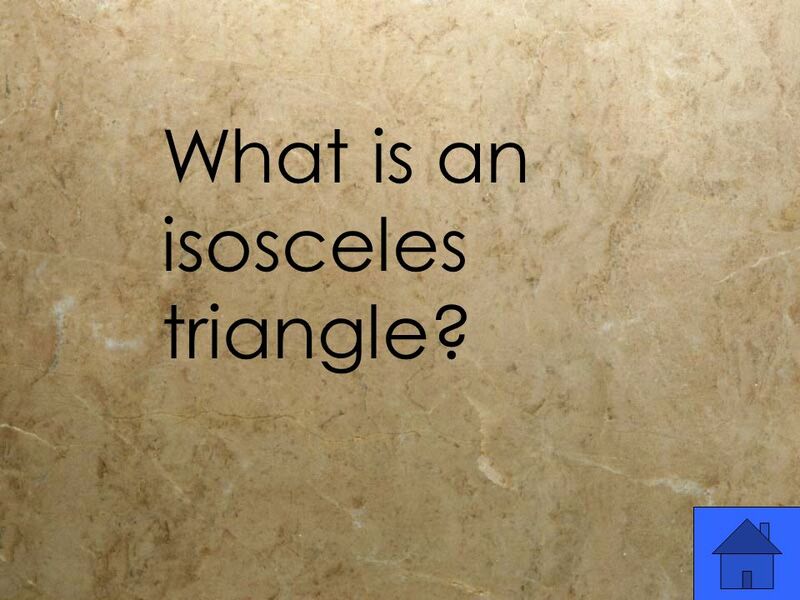 24 What is an isosceles triangle? 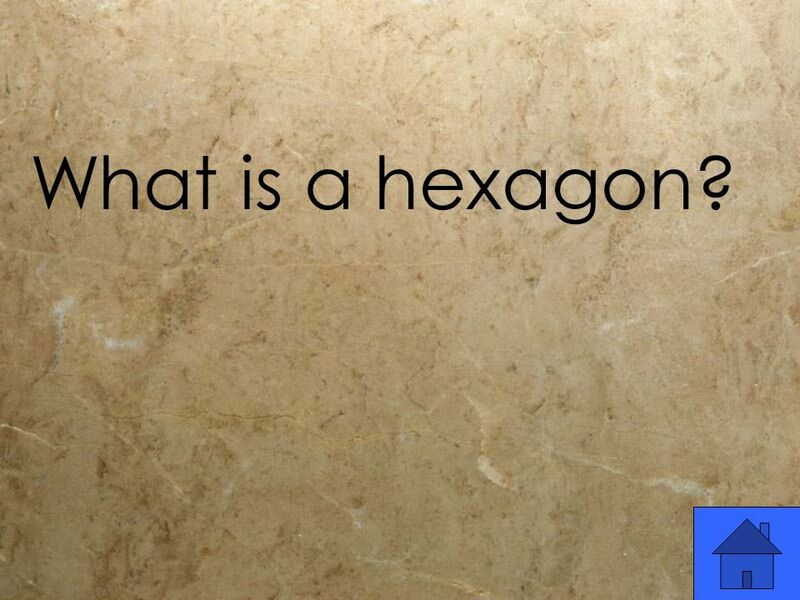 26 What is a hexagon? 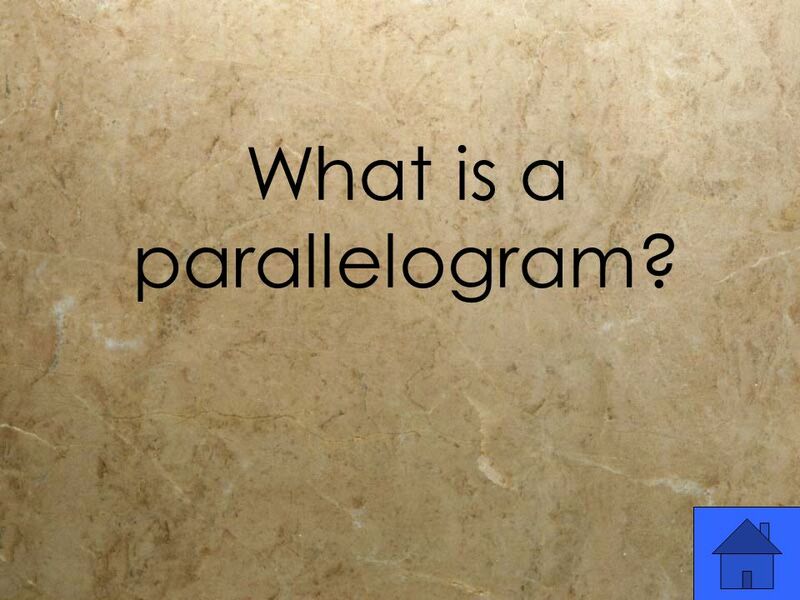 28 What is a parallelogram? 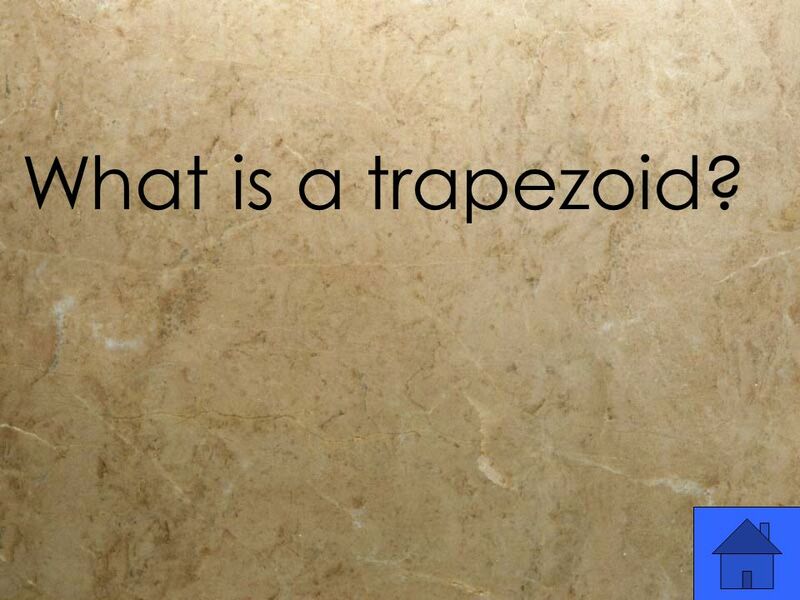 30 What is a trapezoid? 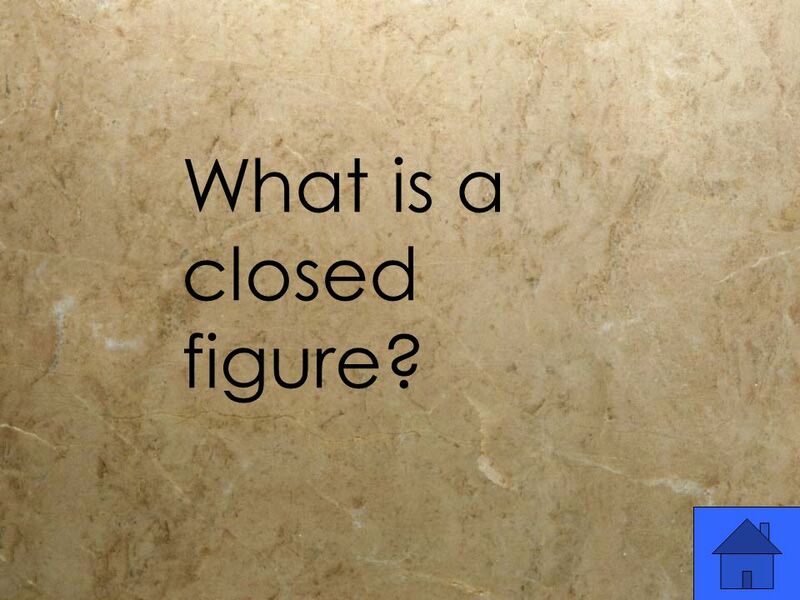 32 What is a closed figure? 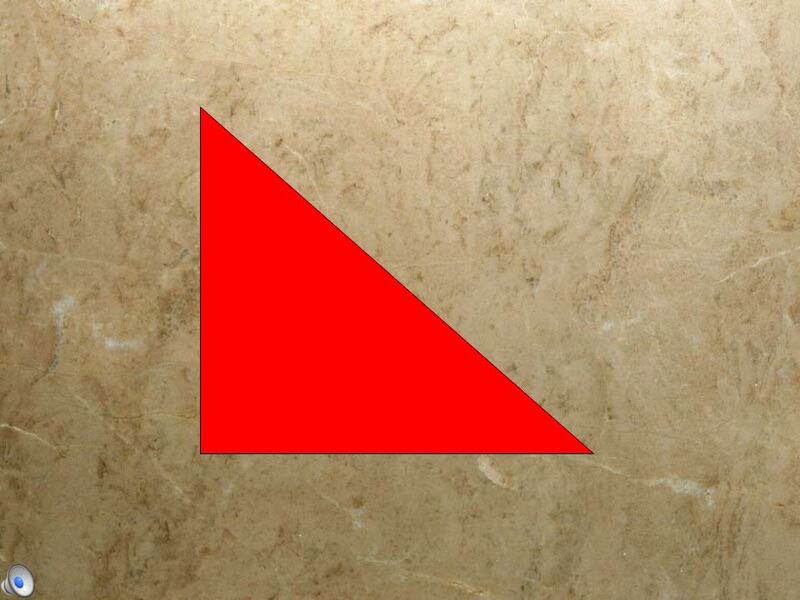 34 What is a right triangle? 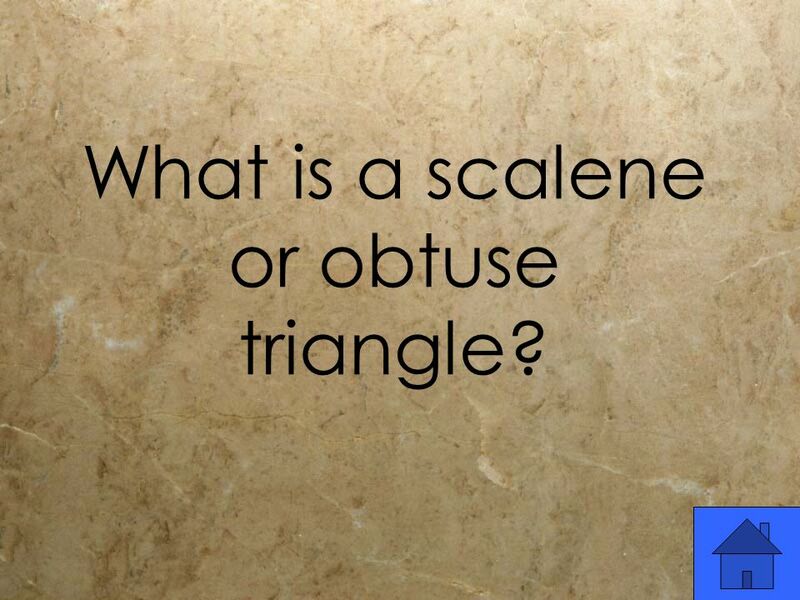 36 What is a scalene or obtuse triangle? 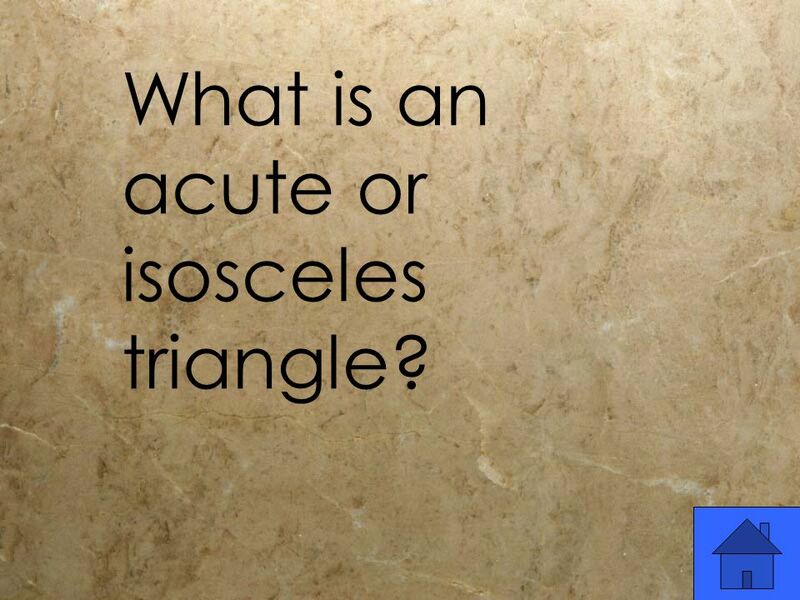 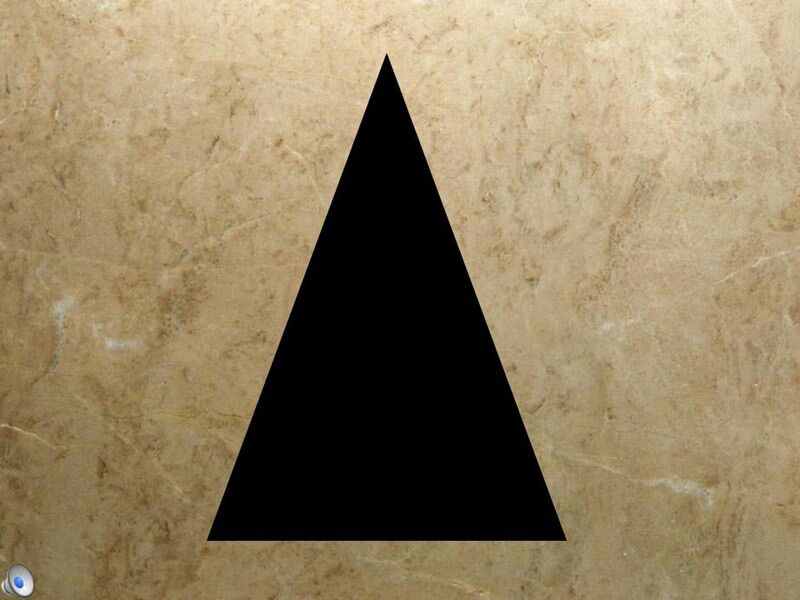 38 What is an acute or isosceles triangle? 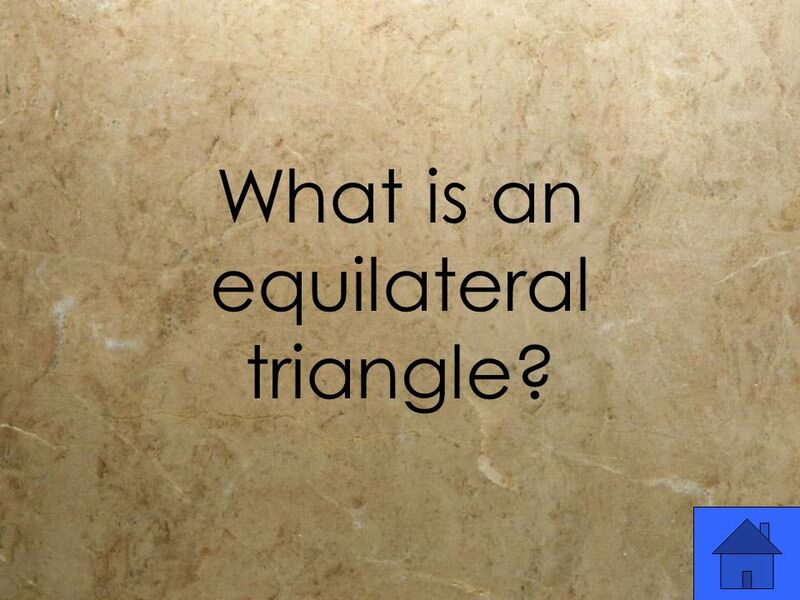 40 What is an equilateral triangle? 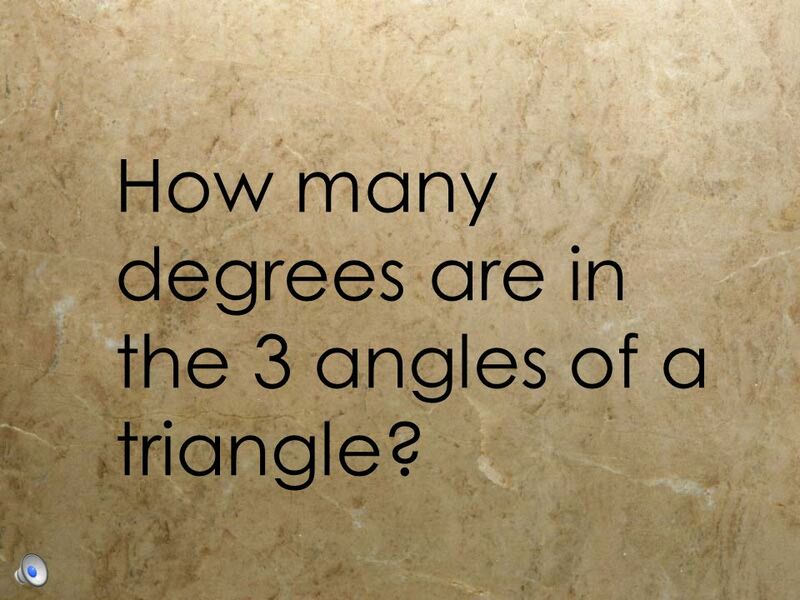 41 How many degrees are in the 3 angles of a triangle? 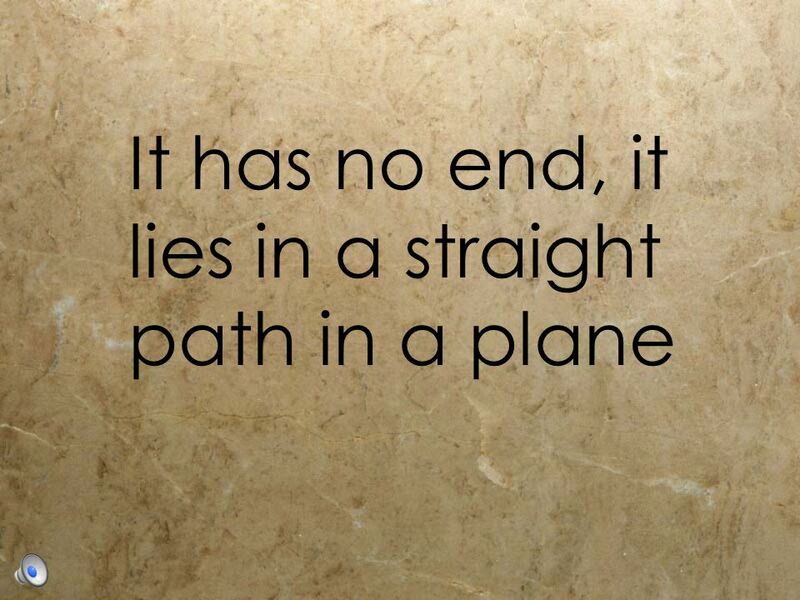 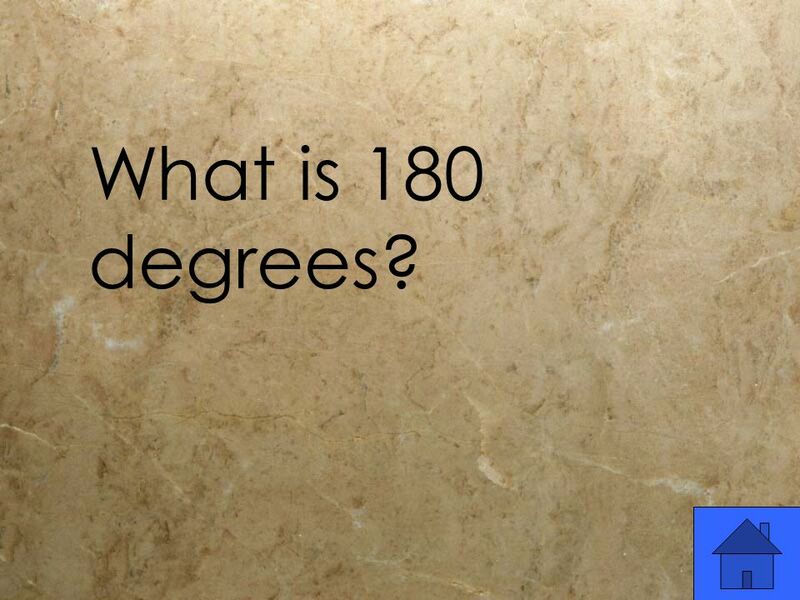 42 What is 180 degrees? 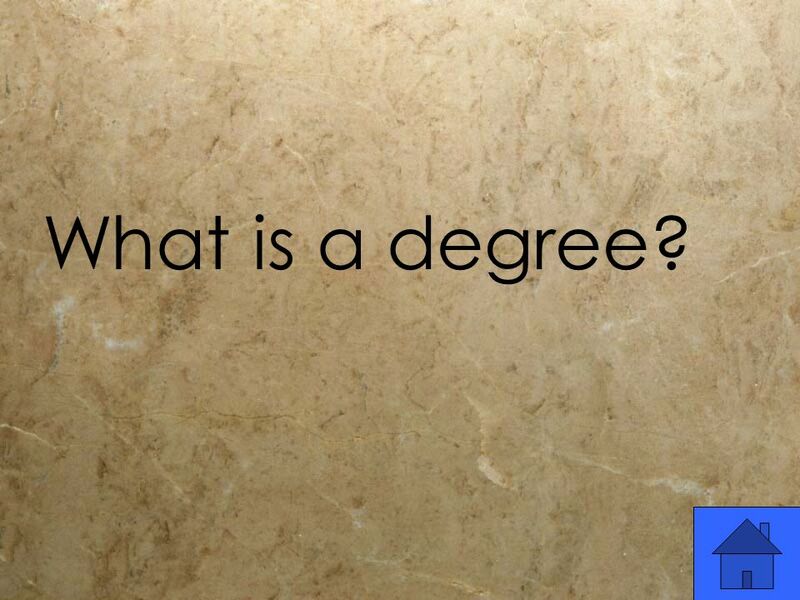 44 What is a degree? 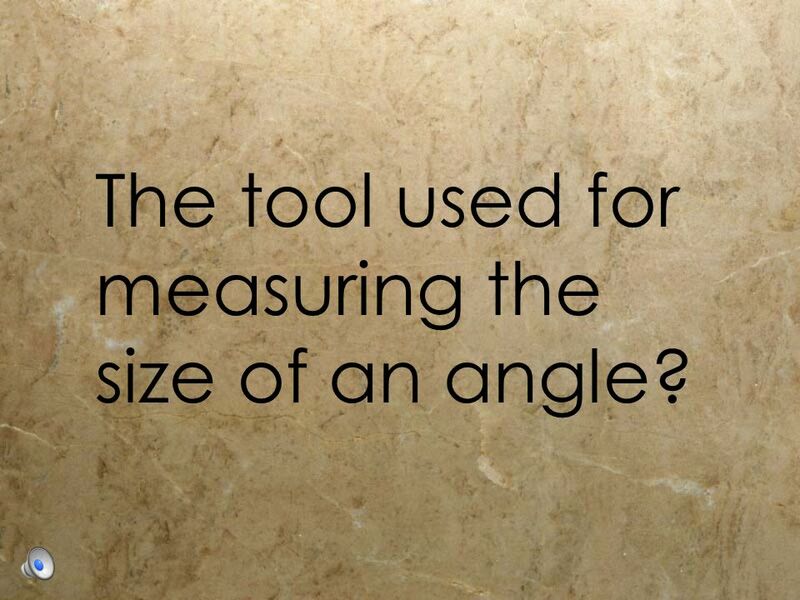 45 The tool used for measuring the size of an angle? 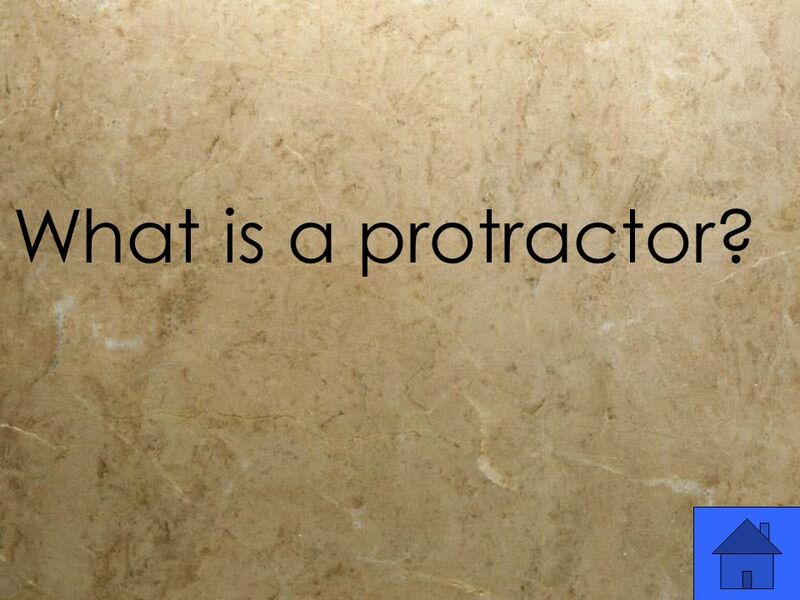 46 What is a protractor? 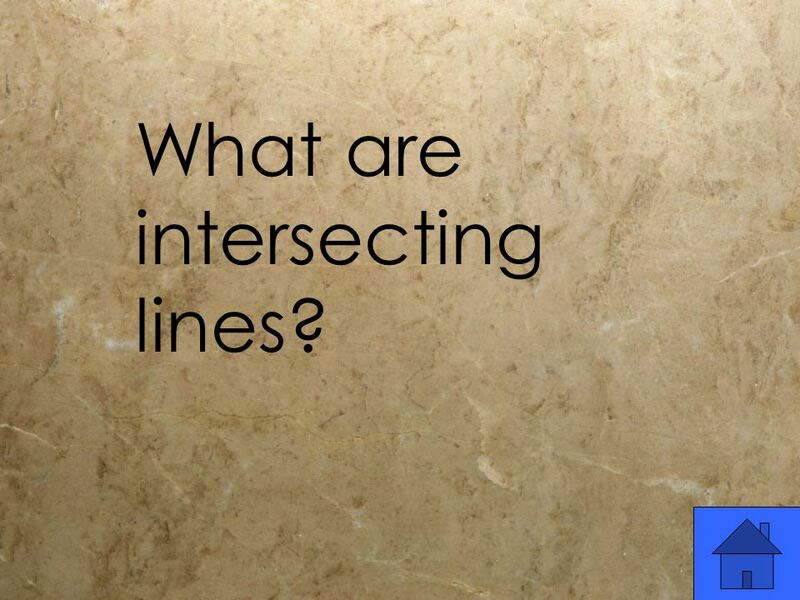 48 What are intersecting lines? 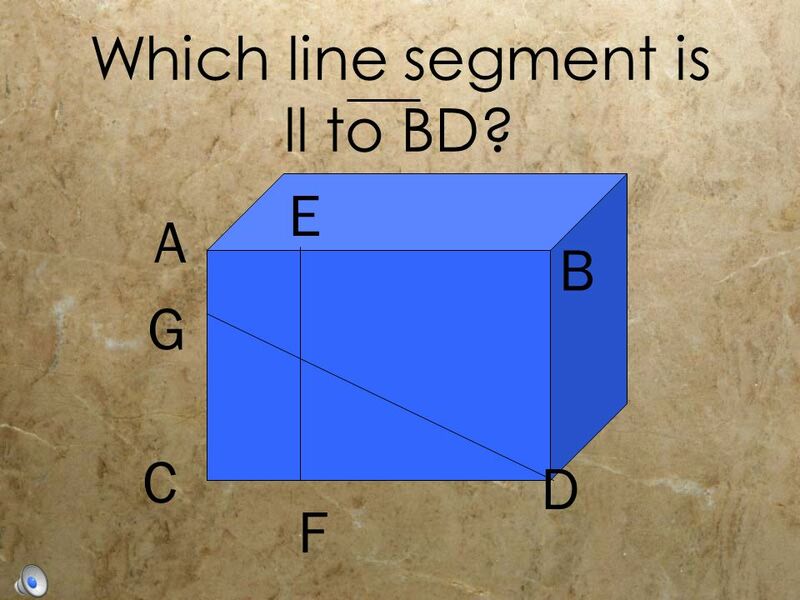 49 A B C D G E F Which line segment is ll to BD? 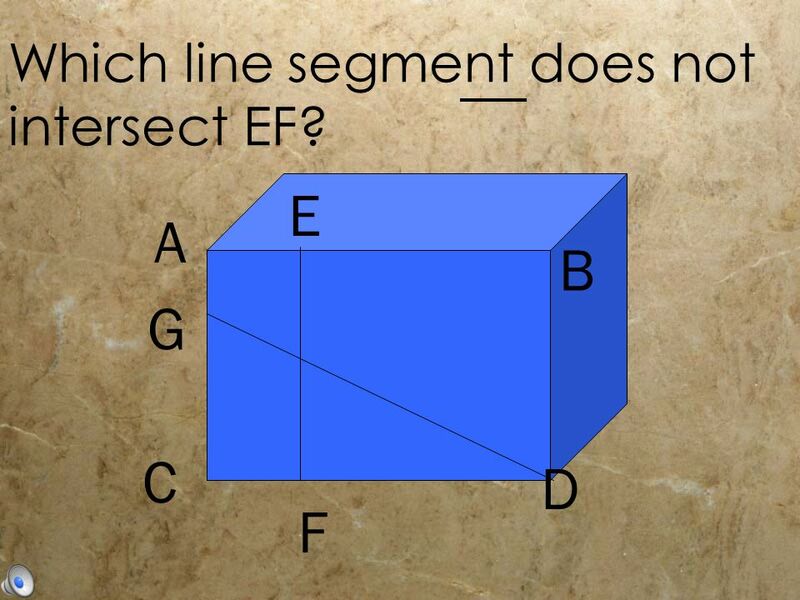 51 A B C D G E F Which line segment does not intersect EF? 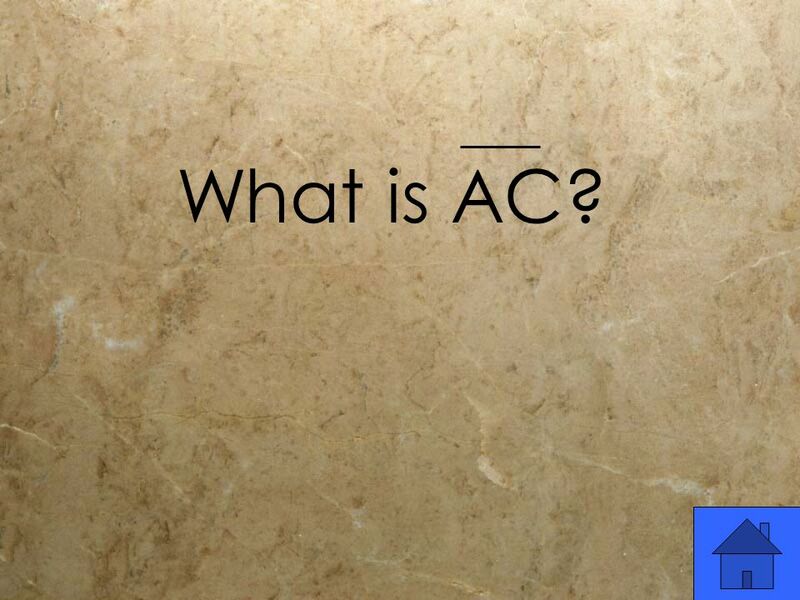 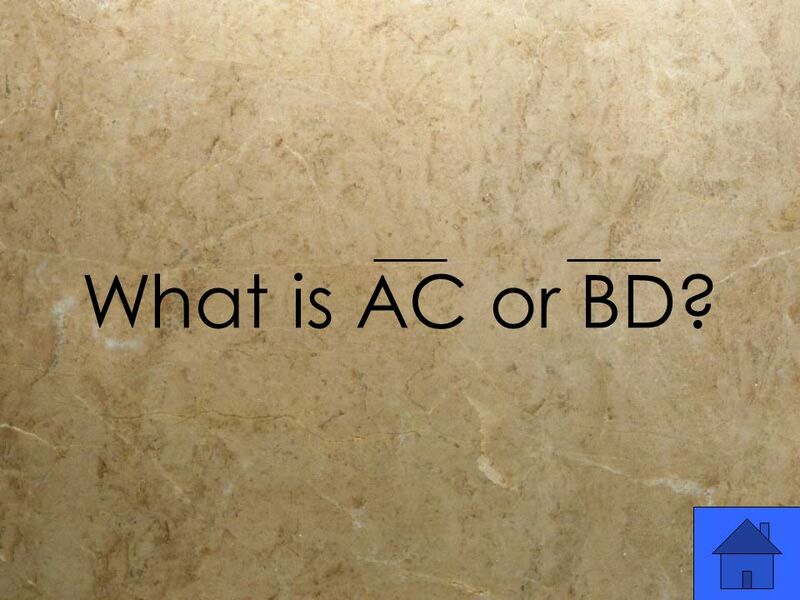 52 What is AC or BD? 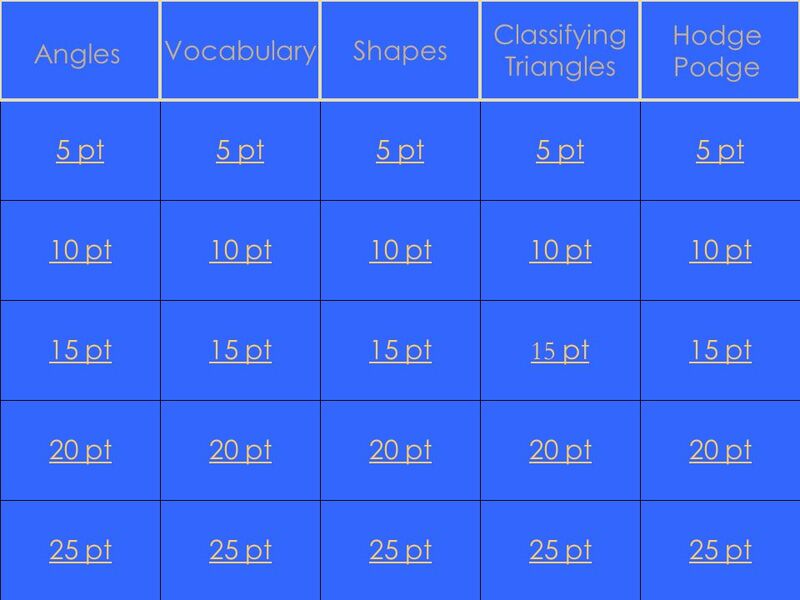 Download ppt "10 pt 15 pt 20 pt 25 pt 5 pt 10 pt 15 pt 20 pt 25 pt 5 pt 10 pt 15 pt 20 pt 25 pt 5 pt 10 pt 15 pt 20 pt 25 pt 5 pt 10 pt 15 pt 20 pt 25 pt 5 pt VocabularyShapes." 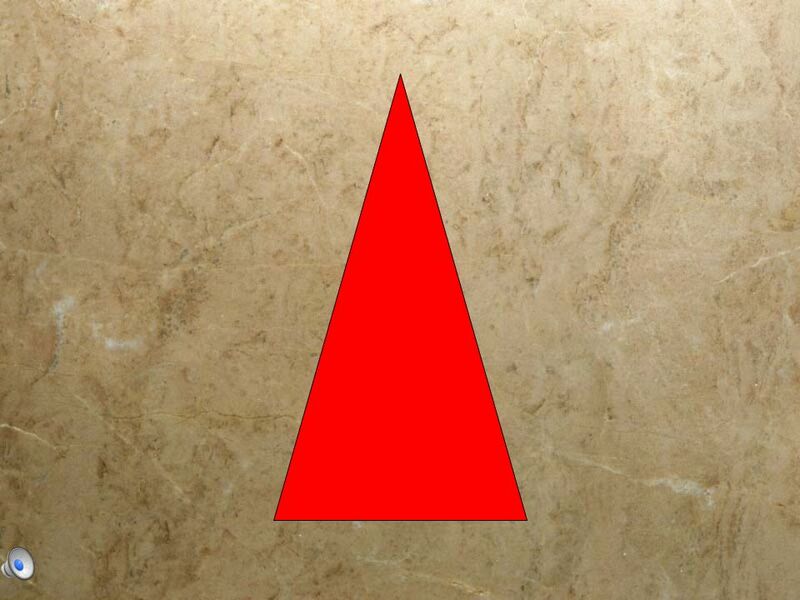 Triangles TOPIC 9 LESSON 9-5. 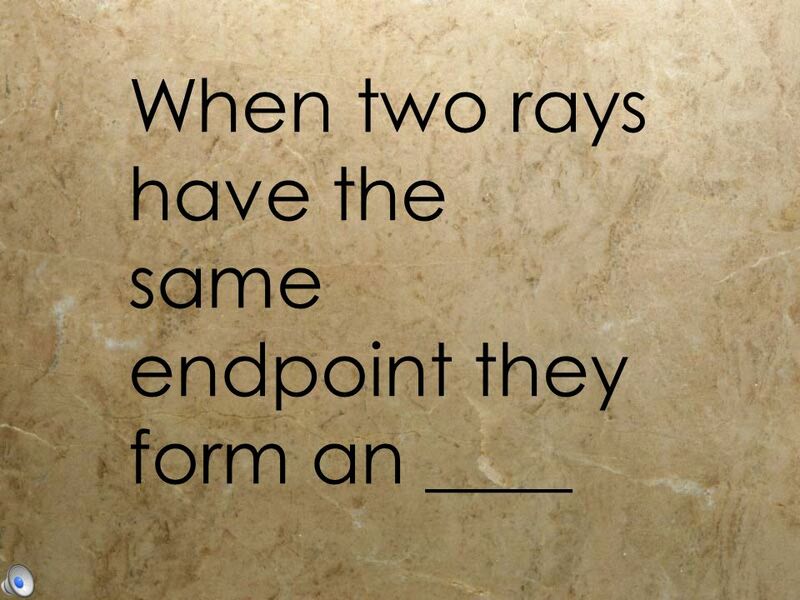  Two rays with a common endpoint form an angle  Two angles are supplementary if they add up to 180° - forming a straight line  Two angles are complimentary. 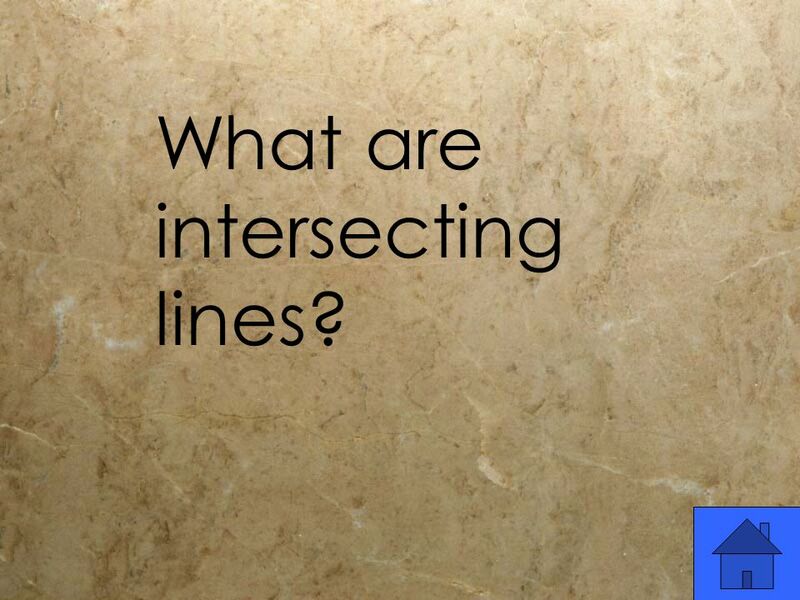 Parallel lines, Perpendicular lines, and line segments By: Mr. Dunkleberger Mechanicsville Elementary School. 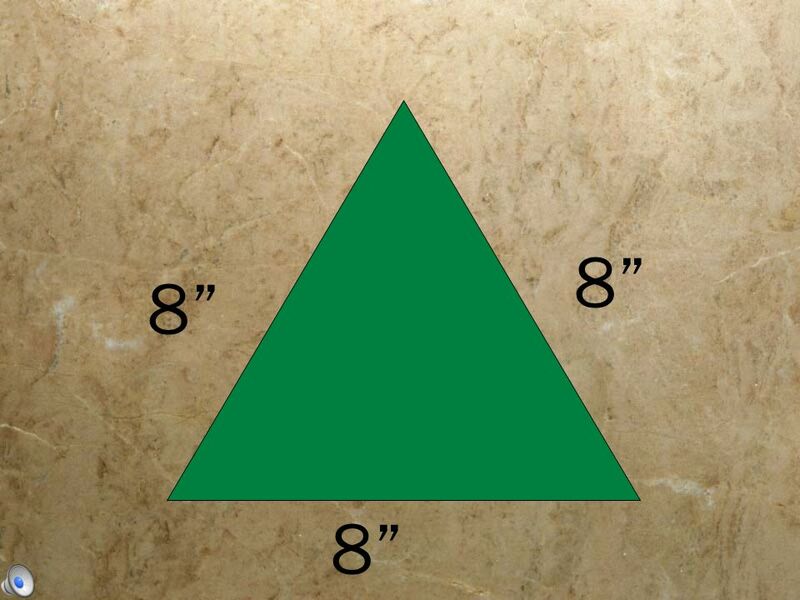 Geometry Game Hosted by EMERSON V.P.A. 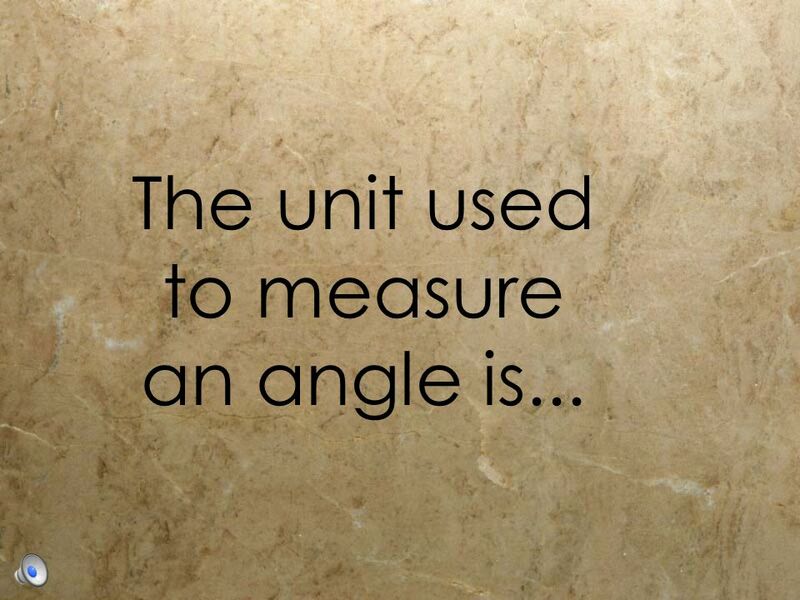 Geometry Class-2005. 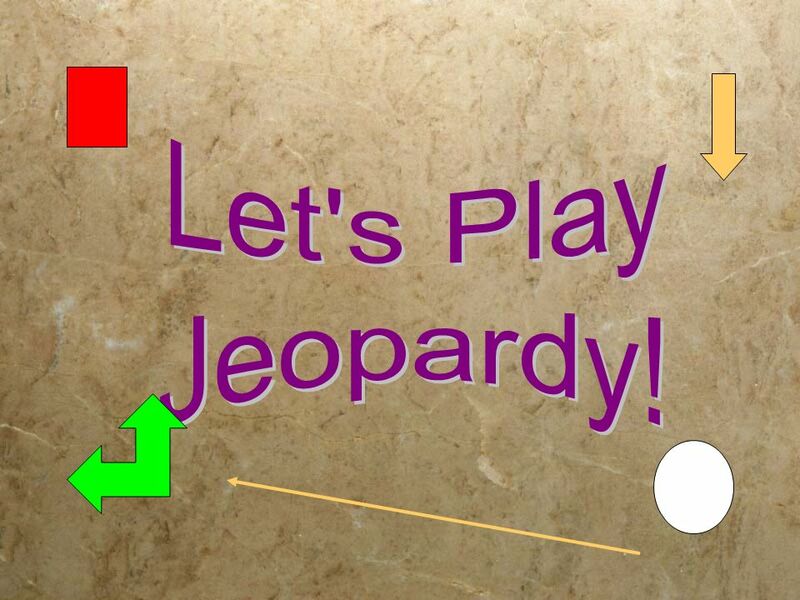 MEAP REVIEW. 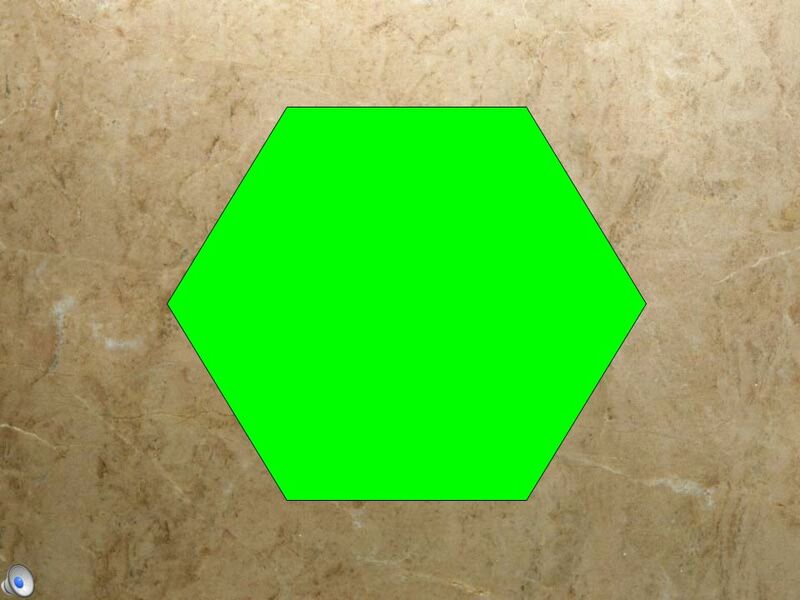 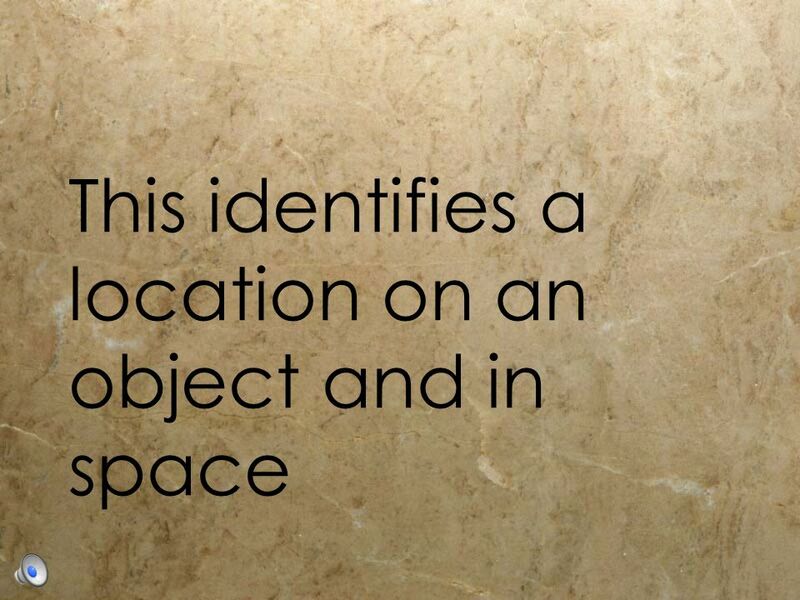 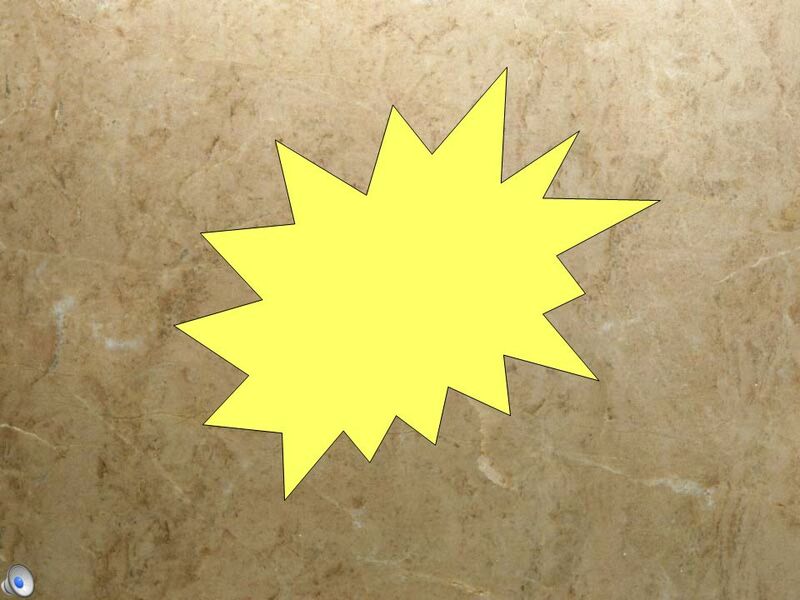 A polygon is a closed figure whose sides are made up of straight line segments that do not cross. 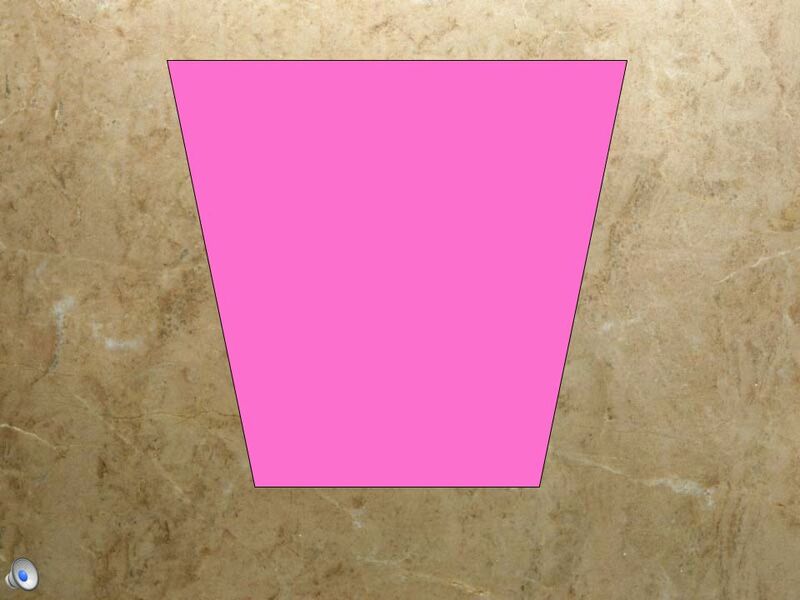 Everyday Math Grade 4 – Lesson 1.3 Part 3: Quadrangles Copyright © 2010 Kelly Mott. 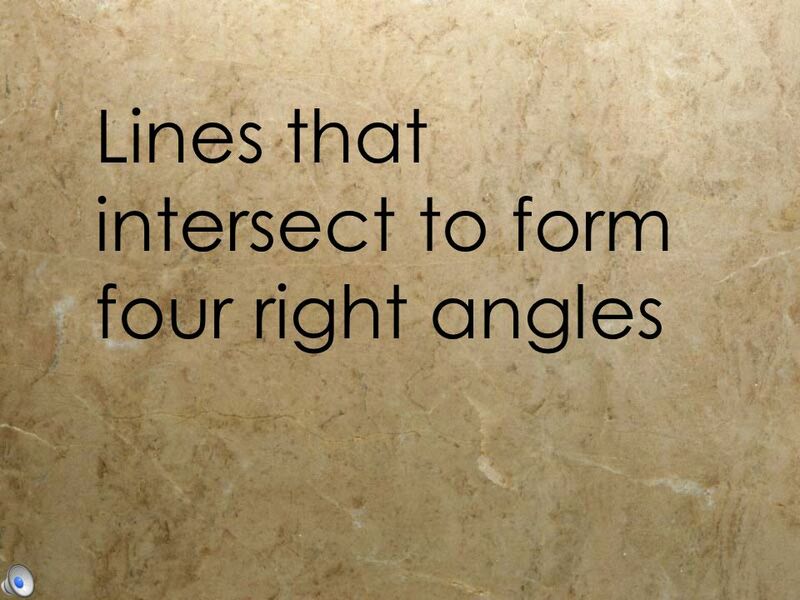 Geometry The Shapes Around Us. 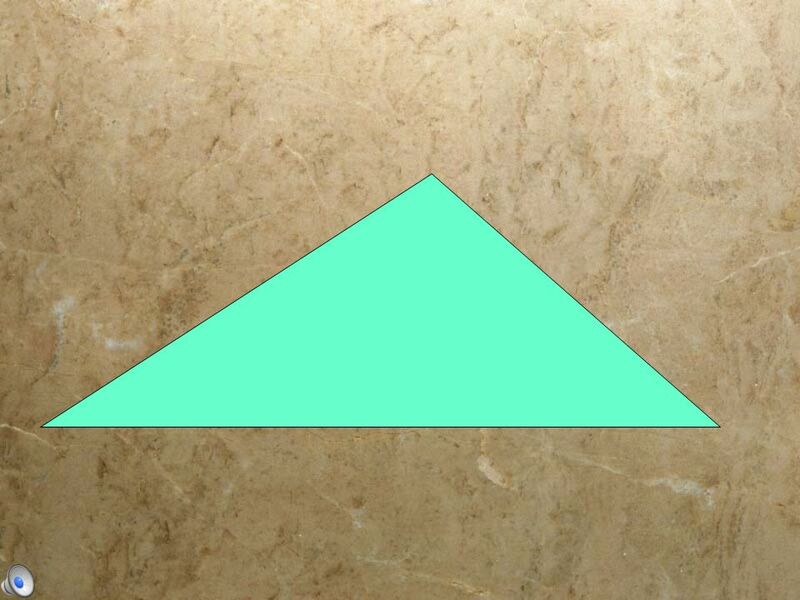 HOW MANY SIDES ARE THERE, AND WHAT IS THEIR ANGLE? 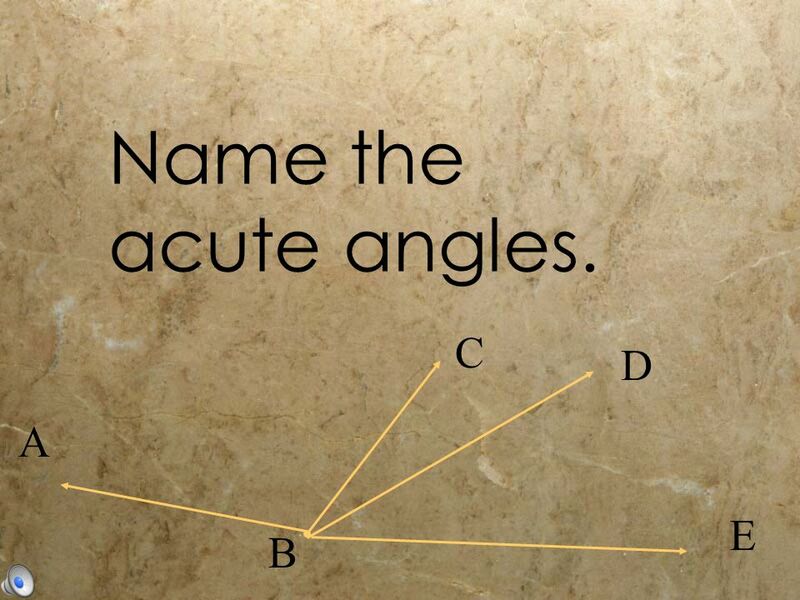 EQUILATERAL & ISOSCELES Quiz tomorrow. 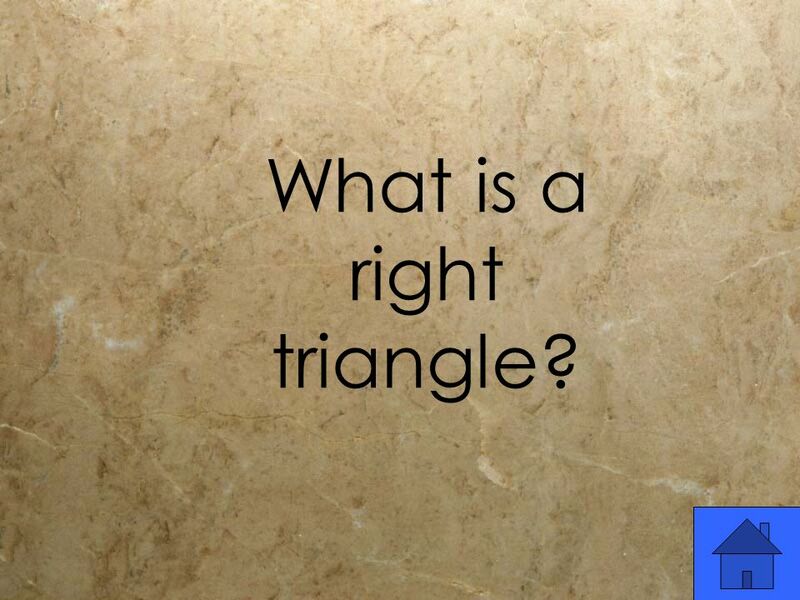 CLASSIFY the triangle by ANGLES and SIDES Angles: acute, obtuse, right Sides:equilateral, isosceles, scalene 91.